I haven’t reviewed any tavernas in the mountains for a while now. That’s because I couldn’t find one that I hadn’t visited before. Thankfully I found a new one last month! The good news is that it is merely 20 minutes from my house in Limassol, yet it feels like miles and miles away from the city. The bad news is that…well there is no bad news! Manolas tavern is in Kellaki village. It is not in the centre but in a more quiet area close to where Mr Manolas’ orchard is. If you think you ‘ve heard of it before you are probably right since the tavern has been up and running for more than 3 decades, owned and operated by the Manolas family. Despite a recent two-year break Mr Manolas is back with his home-grown vegetables and home-made food. The restaurant is quite spacious with a lovely patio on the side. I particularly liked the fact that it is right in front of his cultivated land where he grows the seasonal vegetables used to make most of his dishes. The food includes a selection from the vast traditional Cypriot cuisine. The menu changes depending on the season, and the amount changes depending on how hungry you feel! Mr Manolas disagrees with bringing the standard selection to all people as he believes in treating each customer the way the customer would like to be treated. I liked that the salad was served in a small buffet as it was offered on an all-you-can-eat basis including a couple of standard dips, the seasonal beetroot and “xydata” (i.e. vegetables in vinegar). The starters came relatively quickly and were steaming hot. 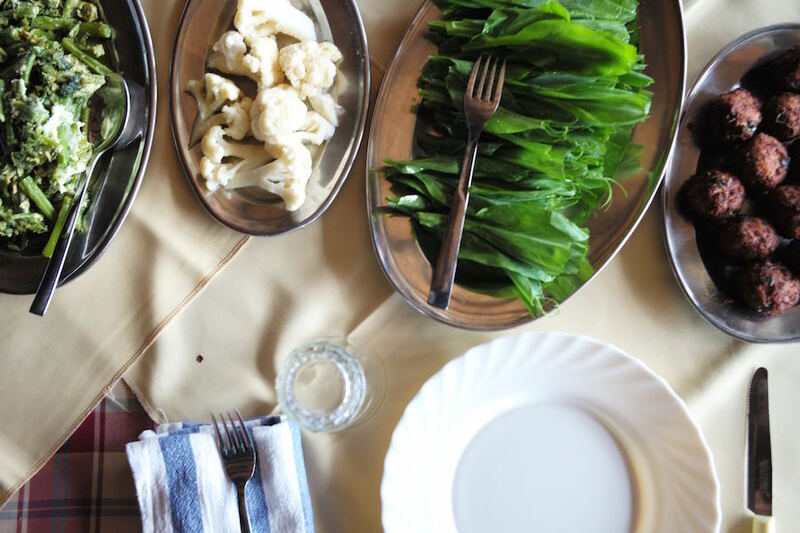 The “strouthouthkia” (seasonal greens) with eggs were full of flavour and so were the freshly fried meatballs. They were small and crispy, something that made it super easy for us to keep nibbling on them. 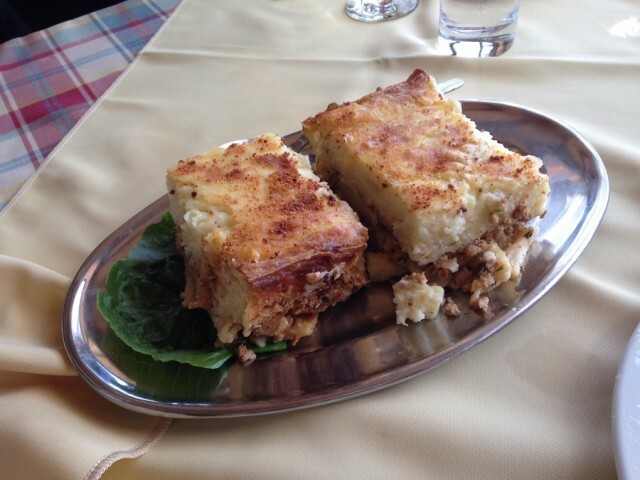 We were then served a generous amount of “koupepia” (stuffed vine leaves), which were also small and tasty while the “pasticcio” (oven baked traditional pasta), had a strong taste of home-made with extra béchamel. 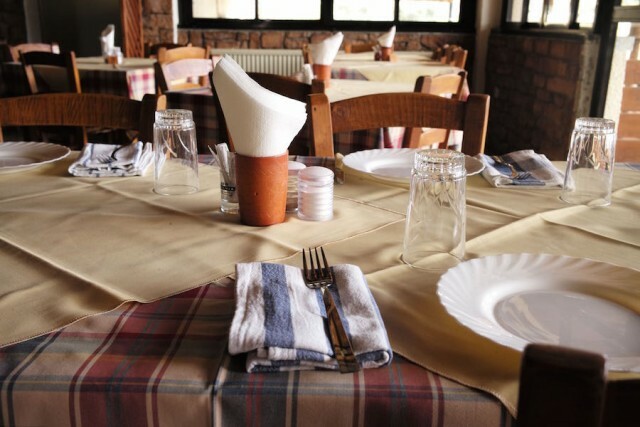 Needless to say that every single dish is prepared by Mrs Melanie, the wife of Mr Manolas who has been doing this since they first started running the taverna. The cherry on the cake (besides the dessert) was the meat dish that was served in a unique way adopted from Argentina, one of many trips that Mr Manolas took in his lifetime. 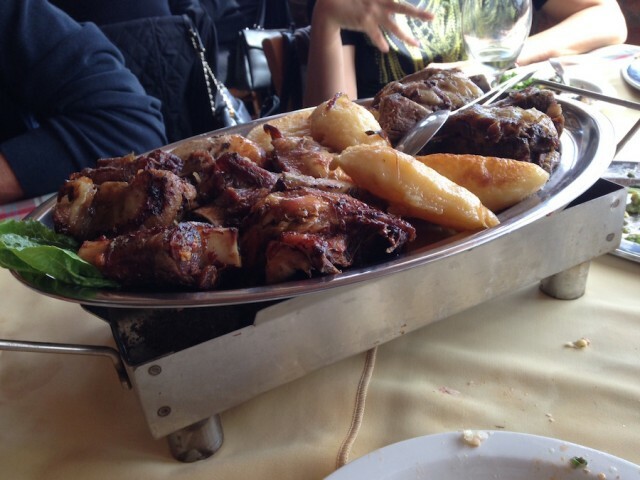 It was served in a silver dish placed on top of a tray with coal to keep the meat warm. The best part was not that, however, but the actual quality of the meat, the tenderness of the lamb “kleftiko” and the lamb “souvla”, something that impressed the entire proud Cypriot family. 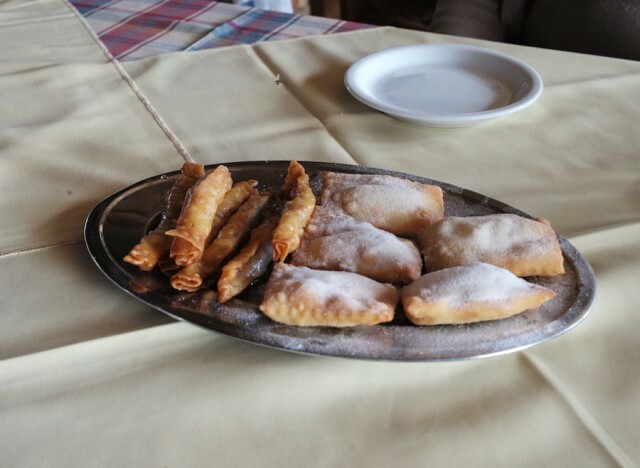 To finish off our meal we were offered freshly fried “bourekia” (pastry filled with “anari” cheese and cinnamon), and “daktyla” (honey coated fried pastry with nuts), that were both delicious. I would like to include this in my list of “family” taverns. Places where you feel at home, places where you eat “grandma’s food” and feel that, regardless of who you are, you have been treated like a special guest. Fortunately you can still find these places (unfortunately mostly in the mountains where tradition has been kept intact). I don’t think I should say more except that, if you live in Limassol visiting Manolas is a no brainer. If you live anywhere else your drive is worth it!